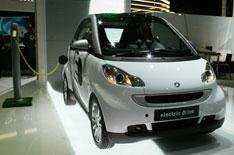 Smart Fortwo EV | What Car? Smart is showing off its Fortwo cdi in Paris, trumping most of the eco concepts with its meagre 88g/km of carbon dioxide emissions. It's not content with that, though, as there's also an electric Smart, which has been trialled in London for almost a year, and has just been revised and launched for trials across Berlin. The latest version of the car uses lithium ion batteries, which are much smaller than the type used previously, and can therefore give a much greater range for the amount of space they take up. A special electronic control unit is also being developed that will 'communicate' with charging stations, so that batteries are topped up when the national grid is below maximum capacity, or energy from alternative sources such as wind power is being produced.